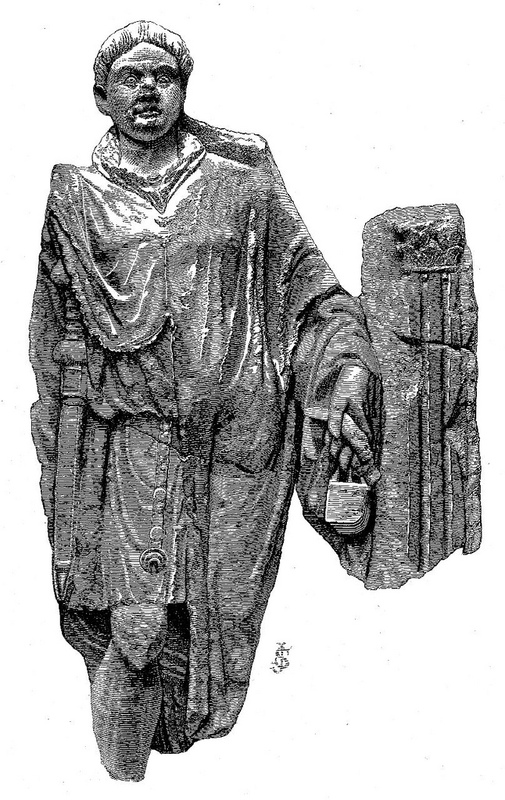 Following the northern wall of the Roman and Medieval city in an easterly direction, a visitor to London passes from Aldersgate Ward Within into Cripplegate Ward Within, so named for one of the original gates of the city, where, it is thought, disabled people gathered to beg throughout the Middle Ages. Unlike the roads extending north from Aldersgate and Bishopsgate, that proceeding from Cripplegate was never a major road connecting London to other cities. 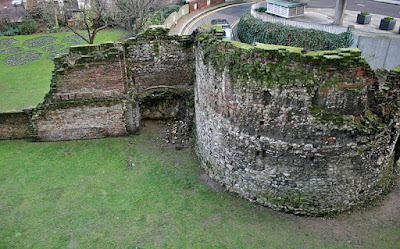 What would become Cripplegate was originally one of four gateways to the Roman fort that occupied the north-west corner of the post-Boudiccan city of Londinium, a fort that seems to have been established around 90 AD. It is larger than an auxiliary fort, but smaller than a legionary fort, so its garrison is likely to have comprised between a thousand and two thousand men. 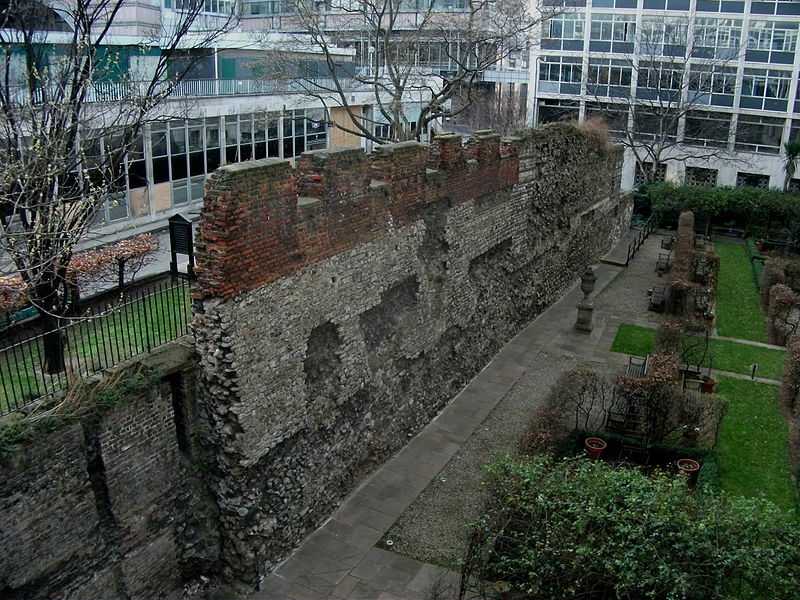 The western gate of the Roman fort, as seen from the Museum Of London. Photo: Mike Peel (www.mikepeel.net), licensed under CCA. The wall of the Roman fort preserved in the garden of Saint Alphege. Photo: Bartholomeus Thoth (licensed under CCA). Since Londinium was, by the end of the First Century AD, the capital of the Province of Britannia, around two hundred of these are likely to have been Beneficiarii Consularis, military administrators concerned with logistics and supply-chains throughout the province. There would also have been around thirty Speculatores, military policemen responsible for the custody and execution of prisoners, and the delivery of dispatches. There would, in addition, have been the Governor's bodyguard of around a thousand men. Tombstone of a Roman soldier of the First Century AD. Since he carries writing equipment, as well as a sword, he was probably an adminstrator. Image: J.E. Price, 1881 (Public Domain). These men would not necessarily have been "Romans" from Italy: a letter found at the Roman fort of Vindolanda, near Hadrian's Wall, refers to the secondment of troops to London from a Tungrian unit - these men would have been recruited in what is now the Netherlands or Belgium, and would have been rewarded with Roman citizenship on completion of their military service. Some, at least, are likely to have married local women and settled in London. 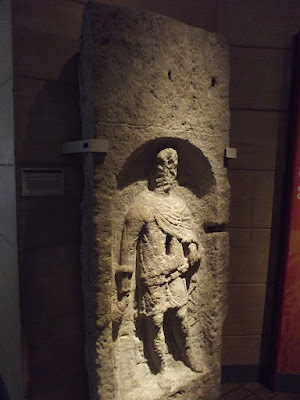 Tombstone of a centurion of the 3rd Century AD, Museum of London. Photo: Elliott Brown (licensed under CCA). When Alfred the Great re-established the City of London in 886 AD, he used the crumbling Roman walls as the basis for his own, although he did not reinstate the earlier fort, instead encouraging civilians to occupy the land to the south of Cripplegate. Some of the Medieval churches of the ward may have Saxon origins, but nothing of these can be seen today. The Hospital of Saint Mary Within Cripplegate was established in 1331 by a mercer, William Elsing, for blind beggars of both sexes. The hospital was initially supervised by five secular clergy (priests who did not belong to a monastic order), but they were found to be too occupied with "concerns of this world" (possibly code for embezzling funds intended to support the inmates - something that later workhouse supervisors frequently did), and replaced by Augustinian canons, whose role continued until Henry VIII's Dissolution of the Monasteries. Cripplegate and Moorgate, as shown on the 16th Century "Woodcut Map" - sometimes wrongly attributed to Ralph Agas (image is in the Public Domain). Cripplegate in c 1650, by Wenceslaus Hollar, University of Toronto (image is in the Public Domain). 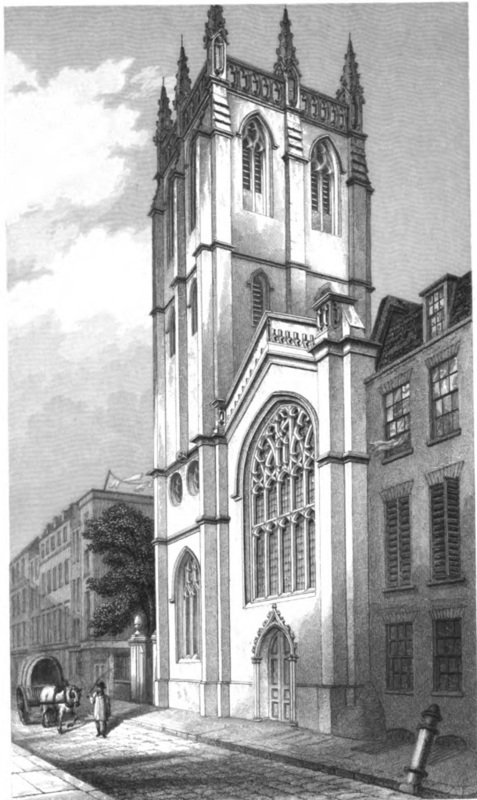 The Church of Saint Alban, Wood Street, in 1839, by George Godwin (image is in the Public Domain). Like most of the City, Cripplegate Ward Within was devastated by the Great Fire of 1666, but was rebuilt, with the Medieval street patterns largely respected. 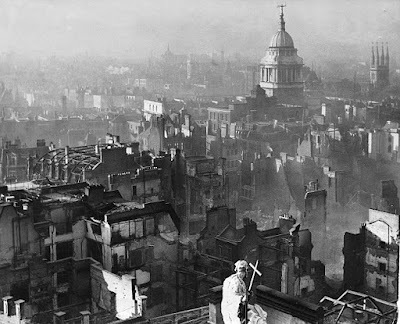 London faced a "Second Great Fire," however, on the night of the 29th/30th December, 1940. In the space of around eight hours, German bombers dropped more than 24,000 high explosive, and more than 100,000 incendiary bombs, destroying nineteen churches and thirty-one livery halls. London in the aftermath of its "Second Great Fire," looking north from the dome of Saint Paul's, by H. Mason for The Daily Mail (image is in the Public Domain). The men of Saint Paul's Watch, who directed the fire-fighting activities were, for the most part, architects, with a clear sense of priority as to which buildings should be preserved. Most of Cripplegate (Within and Without) remained a wasteland throughout the Nineteen-Fifties and Sixties, and, when regeneration did finally come, it was in the shape of the Modernist concrete of the Barbican Estate, with its high-walks and towers, the small fragments of the earlier buildings remaining, like ghosts, to be glimpsed between its pillars. 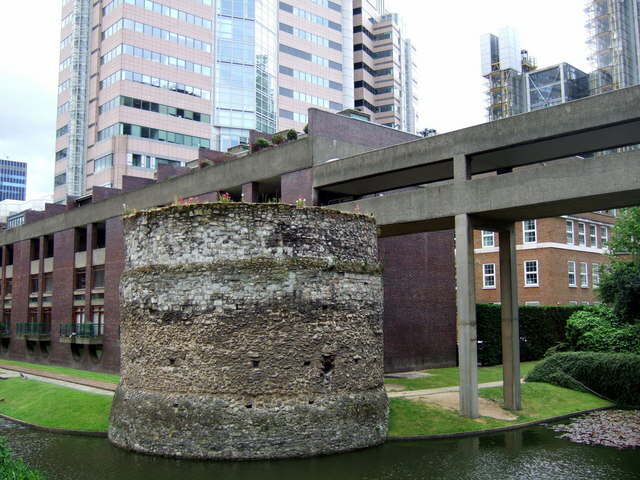 A Roman bastion, preserved within the Barbican Estate. Photo: Ceridwen (licensed under CCA). 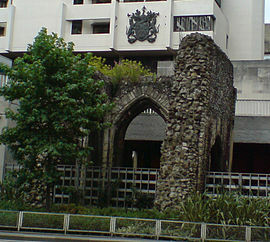 The remains of Saint Alphege, London Wall, originally the chapel of William Elsing's hospital. Photo: Secretlondon (licensed under CCA). The Church of Saint Alban, Wood Street, today, only the tower remaining, as one of the most remarkable private residences in the City. Photo: Neddyseagoon (licensed under GNU). Great post, thanks! I think these "ruins" are London's treasures. Not knowing my way around London, finding them on my next visit is a goal.